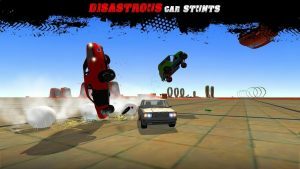 Extreme Car Stunts Classic : Are you brave enough to take the Demolition Car Stunts 3D challenge and skilled enough to master it? 100 way to destroy the muscle car in Danger stimulating stunt arena! Who doesn’t love the thrill that comes with performing serious stunts? Complete the impossible stunts with your Muscle Car. Start your heavy engine and explore extremely unique stunts tracks in this adventure 3D game. Ambitious 3D graphics, realistic vehicle physics, excellent environments are waiting you. Let’s beat the world record jump. Drive your racing car in the thrilling stunt adventure! The wild and crazy fantasy stunts city will blow your mind! Modern stunt environment, awesome car smashing machines and mechanized techno based obstacles. Perform high jumps on colossal ramps; accelerate through fiery hoops; jimmy through deadly propellers; knock down and smash all types of obstacles. Dash and race through the stunt city at lightning fast speed displaying cool tricks! Take your air stunt with nitrous motor car. Smash the dangerous air race with other Muscle car racers and beat heavy wheels records in Extreme city of stunts. Using turbo nitro engine, enjoy rapid nitro power. Tap a nitro button to boost stunt car speed, tap to make nitro flames. You’ll experience realistic car damage, try smashing your muscle, sports and classic carz into obstacles, crashing into walls and flipping by jumping of huge stunt ramps to see full body damage. With our latest extreme car destruction simulator, speed off the biggest jumps, perform the fastest drifts, and zoom to top speeds in our latest exciting game. Here is the best action packed car stunts game to fulfil your moto drifting dreams. It will be a big challenge for all city drivers with the most extreme impossible ramp aligned in a very tricky way. You will get felling of a real stunt rider by playing this extreme stunt car racing tracks simulator games choose your 4×4 car among various vehicle with realistic physics. To perform crazy stunt fasten your seat belt and give full race to your stunt car till it is in the air, but try not to fall down the impossible tracks otherwise you will lose the impossible games. Now dare to be fearless stuntman and drive the stunt car on deadly and impossible tracks in the impossible game. In this impossible game you needs special training as jump high in the sky by doing mid air ramp stunt. Car Stunts on Impossible Tracks is a new experience precision driving simulation for your amazing adventure. Enjoy the thrill of exciting difficult curvy tracks more challenging then climbing the hill. Good game that runs smoothly but WAY TOO MANY ADS. It’s rediculous. Every time you go to pause or reset your car there is an ad. Fix this please!!! Better than any other car crash game I’ve played.